Fetal cervical masses are a challenging congenital malformation to manage; they can grow rapidly, resulting in hydrops fetalis, polyhydramnios, and in-utero fetal demise (IUFD). Among affected fetuses who survive to delivery, asphyxia and death commonly result from airway compromise. Fetal cervical masses are diagnosed with antenatal ultrasonography, and when they are identified, follow-up fetal magnetic resonance imaging (MRI) for further characterization is warranted. Management has evolved over the past two decades, and with the introduction of the ex-utero intrapartum treatment (EXIT) procedure, survival past the neonatal period has significantly improved. Fetal cervical lesions can result from various congenital malformations, with cervical lymphangiomas and cervical teratomas the two most common. The incidence of cervical cystic hygromas, a lymphatic malformation, is fairly high, affecting 1 in 1,000 births. In fact, it has been observed in 1 in 300 spontaneous abortions. Cervical teratomas, the second most common fetal neck mass, are far less common (see the image below), with an unknown incidence. Only 150 cases have been reported in the literature. Other rare neck masses include thyroid malignancies and cysts, branchial cleft cysts, vascular malformations, and neuroblastomas; these are beyond the scope of this article. Once a fetal cervical mass is identified with antenatal ultrasonography, fetal MRI should be performed to help characterize the mass and, if necessary, to assist with preoperative planning. Fetal MRI is valuable in that it aids in delineating solid and cystic components, as well as identifying the presence of fat. In addition, the tracheal anatomy can be evaluated with MRI. Indications for fetal surgery are few; to date, the authors’ institution is the only one to report a successful in-utero resection. An EXIT procedure, on the other hand, should be offered to viable fetuses with complicated airways because it provides an opportunity to manage the airway while the fetus remains on uteroplacental support. If an EXIT procedure is not performed, a pediatric surgeon should be present at the time of delivery in case a surgical airway is required. Appropriate anesthesia and tocolytics are imperative for preventing uterine contractions and placental separation. Uterine atony can lead to diffuse bleeding. Therefore, it is essential to minimize blood loss, to obtain a preoperative type and cross for 4 units of packed red blood cells, and to monitor hematocrits, if necessary. A special fetal uterine stapler can reduce the risk of hemorrhage. Outcomes vary. Early neonatal death after a secured airway during an EXIT procedure may result from pulmonary hypoplasia or prematurity. Outcomes depend on the location, size, and underlying etiology of the cervical mass. Cervical teratomas frequently displace rather than invade surrounding structures; thus resection is often feasible. The malignant potential depends on the pathologic findings, and screening for recurrence with alpha-fetoprotein levels should be routinely performed. Fisher R, Partington A, Dykes E. Cystic hygroma: comparison between prenatal and postnatal diagnosis. J Pediatr Surg. 1996 Apr. 31(4):473-6. [Medline]. Byrne J, Blanc WA, Warburton D, Wigger J. The significance of cystic hygroma in fetuses. Hum Pathol. 1984 Jan. 15(1):61-7. [Medline]. Lazar DA, Cassady CI, Olutoye OO, Moise KJ Jr, Johnson A, Lee TC. Tracheoesophageal displacement index and predictors of airway obstruction for fetuses with neck masses. J Pediatr Surg. 2012 Jan. 47(1):46-50. [Medline]. Hirose S, Sydorak RM, Tsao K, Cauldwell CB, Newman KD, Mychaliska GB. Spectrum of intrapartum management strategies for giant fetal cervical teratoma. J Pediatr Surg. 2003 Mar. 38(3):446-50; discussion 446-50. [Medline]. Liechty KW, Hedrick HL, Hubbard AM, Johnson MP, Wilson RD, Ruchelli ED. Severe pulmonary hypoplasia associated with giant cervical teratomas. J Pediatr Surg. 2006 Jan. 41(1):230-3. [Medline]. Laje P, Johnson MP, Howell LJ, Bebbington MW, Hedrick HL, Flake AW, et al. Ex utero intrapartum treatment in the management of giant cervical teratomas. J Pediatr Surg. 2012 Jun. 47 (6):1208-16. [Medline]. Sheikh F, Akinkuotu A, Olutoye OO, Pimpalwar S, Cassady CI, Fernandes CJ, et al. Prenatally diagnosed neck masses: long-term outcomes and quality of life. J Pediatr Surg. 2015 Jul. 50 (7):1210-3. [Medline]. 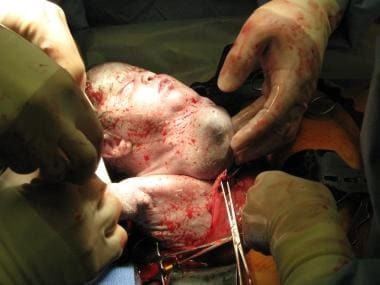 Lazar DA, Olutoye OO, Moise KJ Jr, Ivey RT, Johnson A, Ayres N. Ex-utero intrapartum treatment procedure for giant neck masses--fetal and maternal outcomes. J Pediatr Surg. 2011 May. 46(5):817-22. [Medline]. Wilson RD, Lemerand K, Johnson MP, Flake AW, Bebbington M, Hedrick HL. Reproductive outcomes in subsequent pregnancies after a pregnancy complicated by open maternal-fetal surgery (1996-2007). Am J Obstet Gynecol. 2010 Sep. 203(3):209.e1-6. [Medline]. Byun SH, Lee SY, Hong SY, Ryu T, Kim BJ, Jung JY. Use of the GlideScope video laryngoscope for intubation during ex utero intrapartum treatment in a fetus with a giant cyst of the 4th branchial cleft: A case report. Medicine (Baltimore). 2016 Sep. 95 (39):e4931. [Medline]. [Full Text]. Biehl DR, Yarnell R, Wade JG, Sitar D. The uptake of isoflurane by the foetal lamb in utero: effect on regional blood flow. Can Anaesth Soc J. 1983 Nov. 30(6):581-6. [Medline]. Dwyer R, Fee JP, Moore J. Uptake of halothane and isoflurane by mother and baby during caesarean section. Br J Anaesth. 1995 Apr. 74(4):379-83. [Medline]. Crombleholme TM, Albanese CT. The fetus with airway obstruction. Harrison MR, Evans M, Adzick N, Holzgreve W, eds. The Unborn Patient: The Art and Science of Fetal Therapy. 3rd ed. Philadelphia: WB Saunders; 2001. Özgünen FT, Güleç ÜK, Evrüke İC, Demir SC, Büyükkurt S, Yapıcıoğlu H, et al. Fetal Oropharyngeal and Neck Tumors: Determination of the Need for Ex-Utero Intrapartum Treatment Procedure. Balkan Med J. 2015 Apr. 32 (2):221-5. [Medline]. [Full Text]. Jordan RB, Gauderer MW. Cervical teratomas: an analysis. Literature review and proposed classification. J Pediatr Surg. 1988 Jun. 23(6):583-91. [Medline]. Kerner B, Flaum E, Mathews H, Carlson DE, Pepkowitz SH, Hixon H. Cervical teratoma: prenatal diagnosis and long-term follow-up. Prenat Diagn. 1998 Jan. 18(1):51-9. [Medline]. Bergé SJ, von Lindern JJ, Appel T, Braumann B, Niederhagen B. Diagnosis and management of cervical teratomas. Br J Oral Maxillofac Surg. 2004 Feb. 42(1):41-5. [Medline].